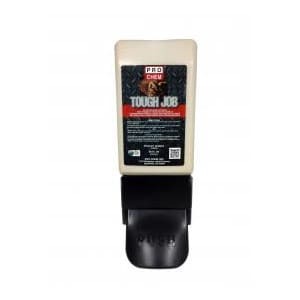 TOUGH JOB | Pro Chem, Inc.
TOUGH JOB is a heavy duty, solvent free, biodegradable walnut shell based cleaner that does it all. It cleans the toughest soils, including greases, inks and paints, while leaving your hands feeling clean, soft and protected. This super concentrated formula is very cost effective, containing only 20% water in comparison to most competitors soaps, which contain 50% to 60% water. TOUGH JOB contains 20% cosmetic grade walnut shells as scrubbers which is the same type of scrubber used in facial scrubs. The high content of such a gentle scrubber, coupled with the superior skin emollients and conditioners leaves the customer with clean, soft hands. With an upside down bottle design, the customer uses every last drop of soap. Environmentally friendly, the soap container and dispenser both contain 30% recycled materials and the product is packed and shipped in 100% post consumable materials. For effective hand cleaning, use of water is recommended. Apply a small portion to hands and rub gently. Rinse with water and dry. If no water is available wipe with clean cloth or paper towel.